My friends love the unique mat. It puts a smile on everyone’s face! Offer family and friends a warm welcome with this whimsical door mat made of 100-percent natural coir. 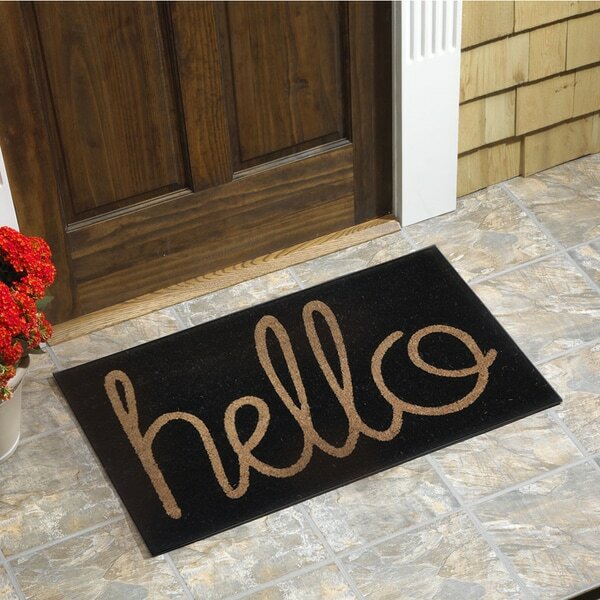 The vinyl-backed mat features a scripted yellow 'hello' on a black background. This rug is great! I love it! Nice size, it fits real good at my door. My family and friends think it the best. Made of good quality. This is an excellence door mat rug. Yes I would order more, and makes a great gift for a new home. This mat is terrific. Great size and really catches the dirt, leaves, and mud. It caught every guests attention as they entered our home. And they were all smiling as they came in. Love this as it says hello but does not welcome anyone. Fussy about whom I welcome. Super cute at our back door. This is very cute and looks great at the back door. It works as well as any door mat, the wording is holding up well. I've purchased a few door mats which had some sort of writing or design which rubbed off after a few months of usage, this one is standing up so far. Looks amazing. Tough and strong to really get the crud off of people's shoes. Love it so much buying one for my fiancee place. This rug is adorable. I really wanted to love it, but unfortunately, the letters wore off within a month of use. It was used at a door which is protected from the elements. This is super cute but due to heavy traffic and bad weather it didn't stay looking good for too long. Might be better on a covered porch. This mat is surprisingly heavier than I thought it would be. LOVE IT! It is a cute door mat, BUT it sheds a ton and any and all white bits of fuzz cling to it. It is very hard to keep looking nice and clean. Super cute, beautiful colors, thick and appears very well made. Definitely not a mat you can use indoors, as too rough to step on, but perfect for the front porch. Ordered this for my daughter for Christmas. It was delivered as expected. It is thick and quality made. Hasn’t been used yet but was just what she wanted. Does shed but have never seen one of these that doesn’t. "How thick is the mat?" It looks very much like a door mat I was just about to order on Grandinroad. It is smaller in size,but less than half the price. You got me at Hello! Seems to be the perfect housewarming gift and there is a history with Adele. It's a dark so I am hoping it will take a beating and "hello" is so pretty and welcoming. Ottomanson Ottohome Collection Rectangular Beige Welcome Doormat (20" X 30") - 20" x 30"